Full Peruvian, true black, out of a true black dam and sire. Has retained his very fine fleece at 6 years of age. He passes on his beautiful head to his crias. Flash has produced a majority of females to date. Jeremiah is a great, affordable Jr. herdsire for a small, new farm. He has a gentle, friendly disposition, perfect conformation and bite, and dense, crimpy fleece. 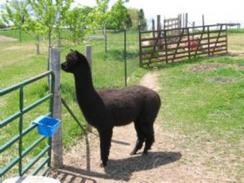 With a medium fawn dam and a true black Peruvian sire, Jeremiah is sure to produce some color in his crias.